Second in my book only to Roger Zelazny's A Night in the Lonesome October, a "must read" story for the Halloween season is Ray Bradbury's The Halloween Tree (1972). "Well, boys, do you see? It's all one, yes?" "Always the same but different, eh? every age, every time. Day was always over. Night was always coming. And aren't you always afraid, Apeman there? or you, Mummy, that the sun will never rise again?" "Yesss," more of them whispered. And they looked up through the levels of the great house and saw every age, every story, and all the men in history staring round about as the sun rose and set. Apemen trembled. Egyptians cried laments. Greeks and Romans paraded their dead. Summer fell dead. Winter put it in the grave. A billion voices wept. The wind of time shook the vast house. The windows rattled and broke like men's eyes, into crystal tears. Then, with cries of delight, ten thousand times a million men welcomed back bright summer suns which rose to burn each window with fire! "Do you see, lads? Think! People vanished forever. They died, oh Lord, they died! but came back in dreams. Those dreams were called Ghosts, and frightened men in every age--"
"Ah!" cried a billion voices from attics and basements. Shadows climbed walls like old films rerun in ancient theaters. Puffs of smoke lingered at doors with sad eyes and gibbering mouths. "Night and day. Summer and winter, boys. Seedtime and harvest. Life and death. That's what Halloween is, all rolled up in one. Noon and midnight. Being born, boys. Rolling over, playing dead like dogs, lads. And getting up again, barking, racing through thousands of years of death each day and each night Halloween, boys, every night, every single night dark and fearful until at last you made it and hid in cities and towns and had some rest and could get your breath. "And you began to live longer and have more time, and space out the deaths, and put away fear, and at last have only special days in each year when you thought of night and dawn and spring and autumn and being born and being dead. "And it all adds up. Four thousand years ago, one hundred years ago, this year, one place or another, but the celebrations all the same-"
"The Time of the Dead Ones--"
"The Day of the Dead." Oooooh, that's fantastic! 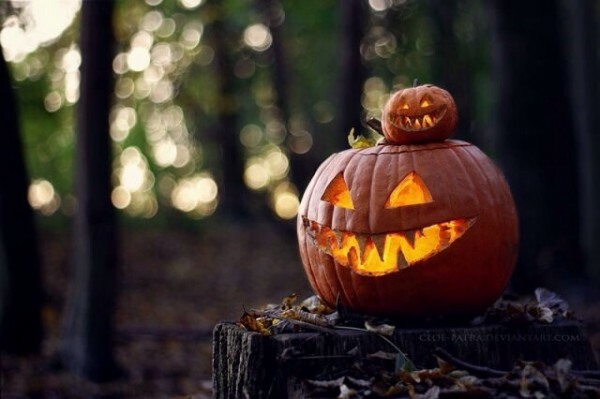 And I love that pumpkin pic! Look at those faces! Yay! I'm so glad you liked it. I loved those creepy pumpkin faces, too! Such gleefully sinister grins! Here's another Halloween-themed blog-a-day I came across. Kenneth Hite is doing one concerning adaptations of Dracula. Brilliant! Thanks for the link. I'll repost this soon with thanks to you. I've never read The Halloween Tree, but I have the film adaptation of Something Wicked This Way Comes and watch it around this time of year. It's got a good atmosphere, but I can't get into Bradbury for his lack of female characters. "Boys...lads...men..."
Isn't that photo great? (I can't take credit for it.) Such gleeful smiles! I love Bradbury's lyrical prose, but you're right, you have to overlook the fact his nostalgic view is very one-sided from a gender perspective. My ability to make apposite comments seems to have deserted me of late, but I am enjoying your Halloween posts - thank you. Both are great books, but I wish that Bradbury hadn't made Samhain quite so evil. Woohoo! Happy reading! It's like one big fanboy love note. His enthusiasm is infectious, I've found. I hope you enjoy it. Two of my favorite books! It just isn't the Halloween season without revisiting both. A Night in the Lonesome October is my top choice but we just finished listening to The Halloween Tree again and it is excellent! Ray Bradbury is a master of words. I had to buy a copy to read just for the joy of savoring the language...not to mention the history! Yay! Great minds think alike, right? ;) I agree about Bradbury's language. Parts of The Halloween Tree read almost like a prose poem to me. Delicious stuff.